There isn't a tomato in sight here. Those reddish/orangeish spots you see? Carrots. Not tomatoes. Like I said. Aside from that single omission, what we have here is your basic (and very tasty) Bolognese sauce, or, more properly, ragu. Except that this isn't a Bolognese ragu at all. Because a Bolognese must include at least a little bit of tomato. 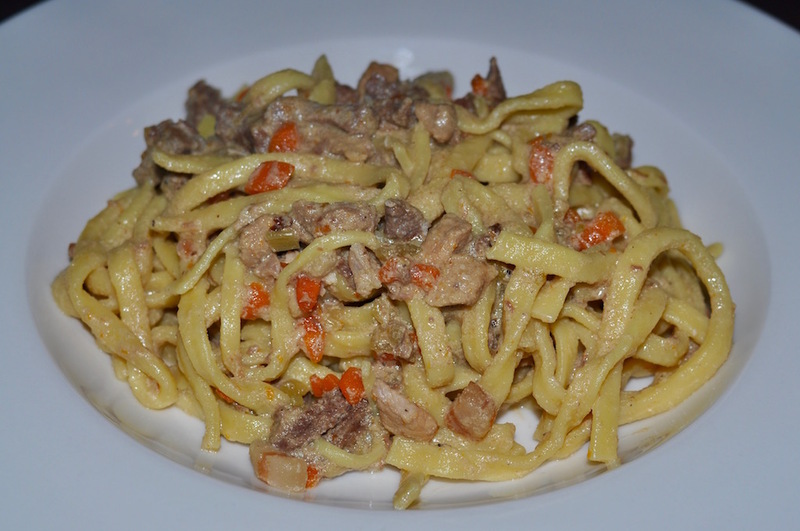 You can call it a Bolognese if it doesn't have tomato, as many people do. But you—and they—would be wrong to do so. 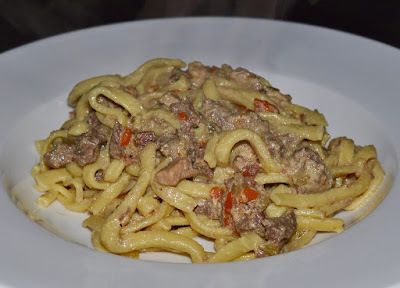 You want a true Bolognese? Then click right here and I'll show you one. 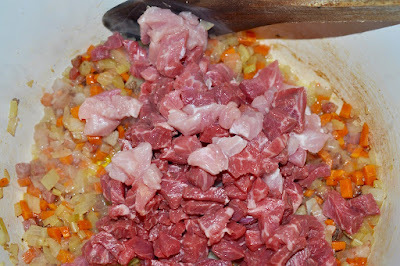 Otherwise bear with me while we prepare what most people call a "White Bolognese." 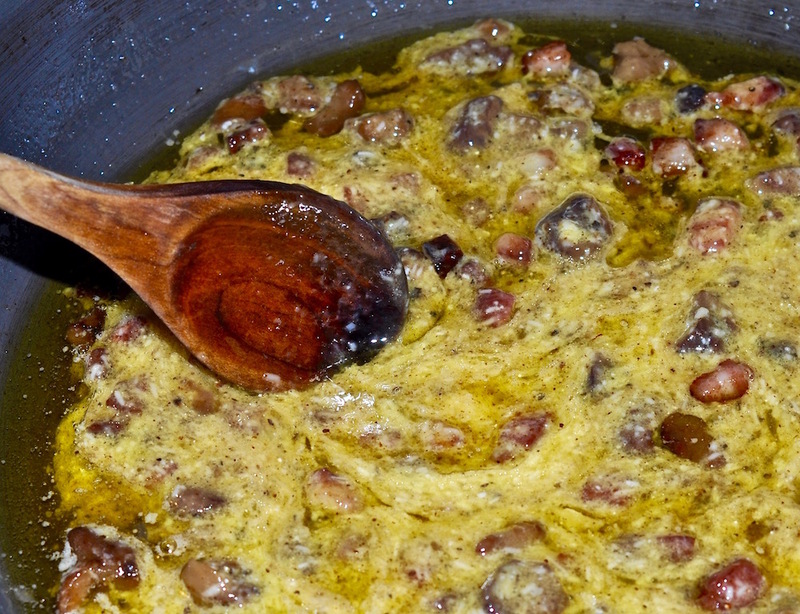 Most people, that is, except for the ones in Bologna, Italy, home to the classic ragu. And me, of course. This is pretty simple stuff. 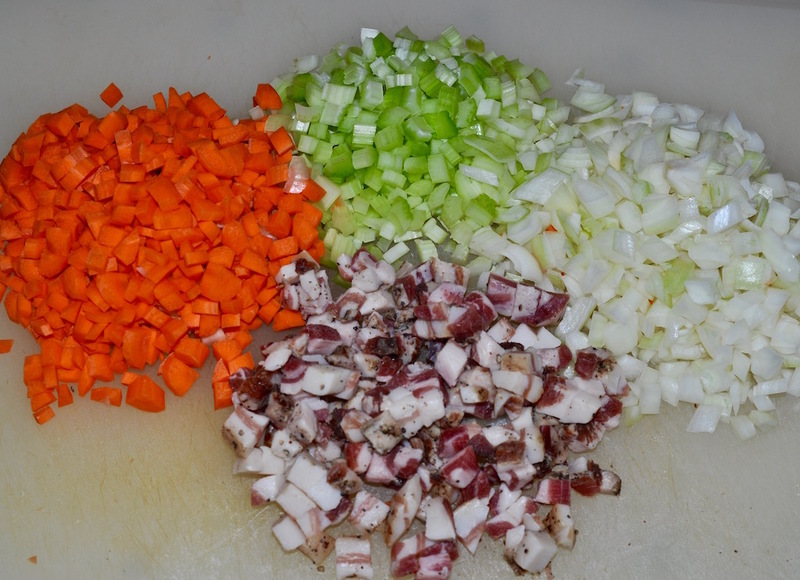 Two large carrots, three celery stalks, a medium-size onion and around 1/4 pound of pancetta, all diced pretty fine. 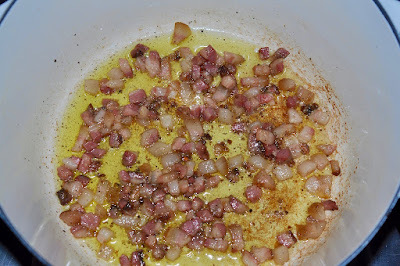 In a dutch oven slowly brown the pancetta in olive oil at a low heat. When the pancetta has lightly browned (not too crispy) add the vegetables and 1/2 cup of dry white wine or vermouth and cook at medium to high heat until the wine has evaporated. Here I've finely diced 1 pound of beef (boneless short rib here) and around 1/4 pound of pork (boneless rib). 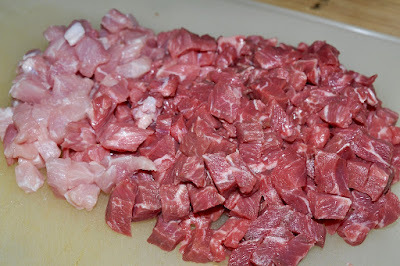 Feel free to use just a pound of beef (even ground), as I was just playing around by adding a little pork. Hell, I'd planned on throwing in a couple chicken livers but forgot that I'd bought them and so they stayed in the fridge. Dammit! Once the wine evaporates add the meat and allow it to brown lightly. The add around two cups of homemade stock (I used chicken stock, but only because I didn't have any beef stock left in the freezer). 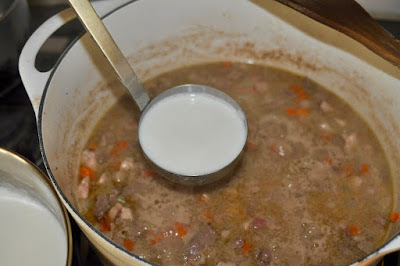 As the sauce is simmering (at medium-low heat) keep a small pot filled with a quart of whole milk on extremely low heat. Every 15 minutes or so stir in a little milk until it's used up. 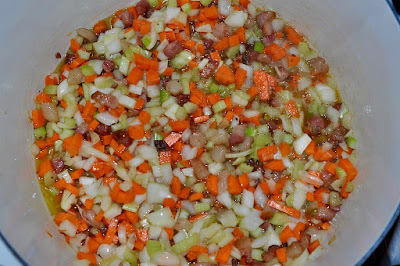 In around two hours the sauce will be done. 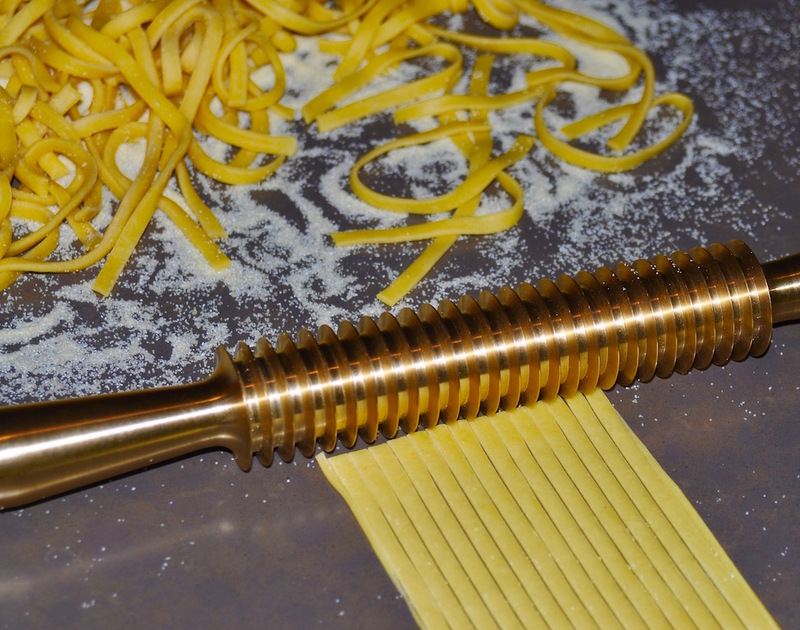 Even though I wasn't making a Bolognese I thought it'd be nice to use one of the brass pasta cutters we picked up in Bologna last year. But you go ahead and use any pasta you like. 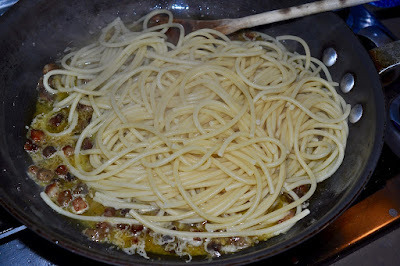 This is a shot of the unadulterated end result, but I highly recommend topping the pasta with some Parmigiano-Reggiano. Oh, and if you're not in a hurry, prepare the sauce a day in advance, not the day you want to eat it. This is definitely the kind of thing that improves overnight. No matter what you call it. I'm the last guy to mess with tradition. 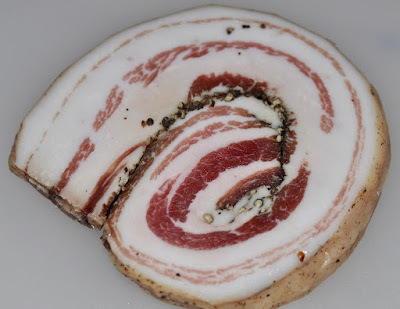 Ask anybody who has eaten in my home when I am working the line and all will tell you the same thing: The guy leans heavily towards perfecting the classics, not merely approximating or (gasp!) reinventing them. Take Spaghetti alla Carbonara. It took me years to get this seemingly simple Roman classic right—a lot of them. 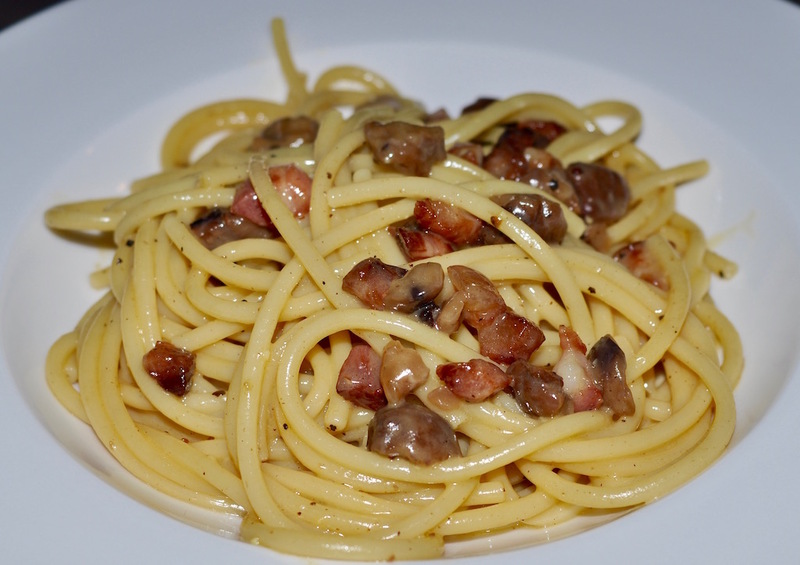 When I did finally manage it ("The Best Spaghetti Carbonara") I never looked back. Until last night, that is. 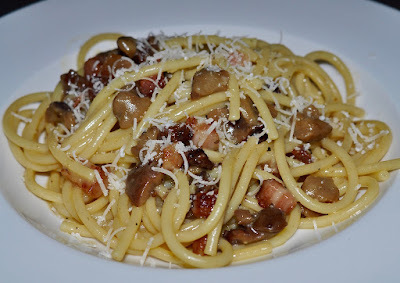 For reasons that cannot be explained I spent the entire day pondering how the addition of chestnuts—yes, chestnuts—might impact a classic carbonara. Scratch that, actually. I spent the entire day convinced that the addition of chestnuts would make an absolutely terrific addition to this classic. So what if a Web search around midday discovered virtually no evidence that anybody else in the culinary universe had come to the same conclusion. 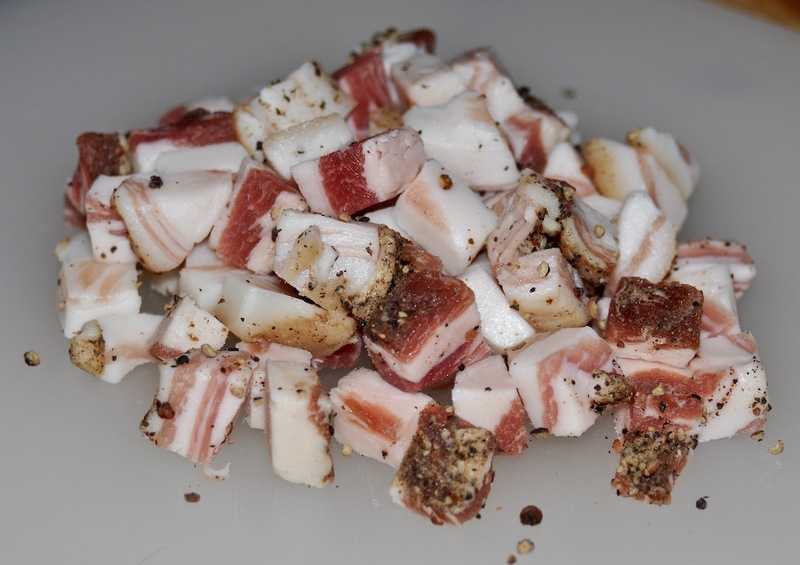 So, this is around one-third pound of my homemade pancetta. 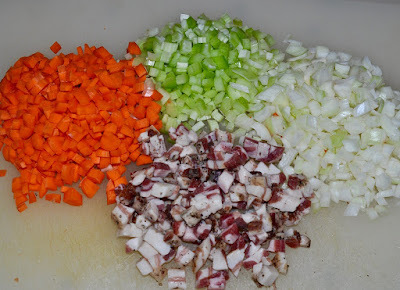 It's what I begin every carbonara with. You can use pancetta, or guanciale, or even thick-cut bacon. This is around a quarter pound of cooked-and-peeled chestnuts, which should also be chopped, like so. 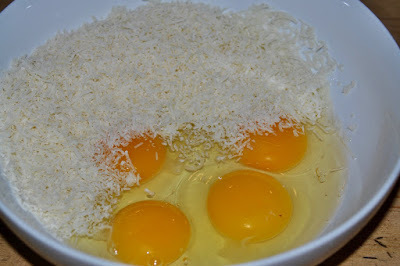 This is three large eggs, one egg yolk, and 1/2 cup of grated and mixed Pecorino Romano and Parmigiano-Reggiano cheeses. 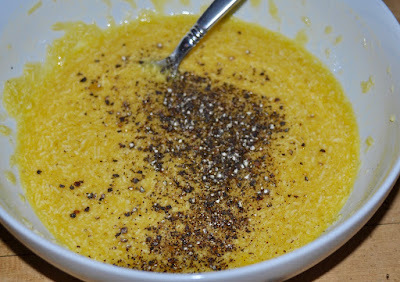 Mix the egg and cheese together and then add a good dose of freshly grated black pepper. In a large skillet cook the pancetta in olive oil, slowly and at a low flame, until lightly browned. Stir in the chestnuts and saute for another minute, then turn off the heat and wait for three minutes before proceeding further. After the pan with the pancetta and chestnuts has cooled for three minutes add the egg and cheese mixture and let it stand until your pasta is cooked. When your pasta is al dente add it to the pan and quickly incorporate. The hot pasta and slightly warmed egg and cheese mixure should provide ample heat to cook the egg to proper carbonara consistency. If not, and the egg remains very wet, carefully apply just a little flame to finish things off—but be very careful, as too much heat will scramble the eggs. All that's left to do now is plate the pasta (I used bucatini here, which works well with carbonara), grate some cheese over it, and serve. I was right about this being a swell idea, by the way. 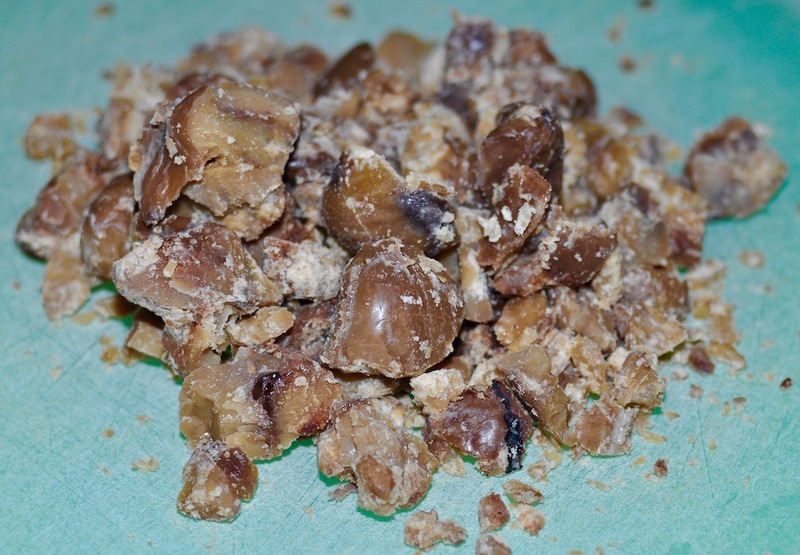 But take the recipe out for a spin and let me know what you think. Heat the oil in a large pan over low heat. 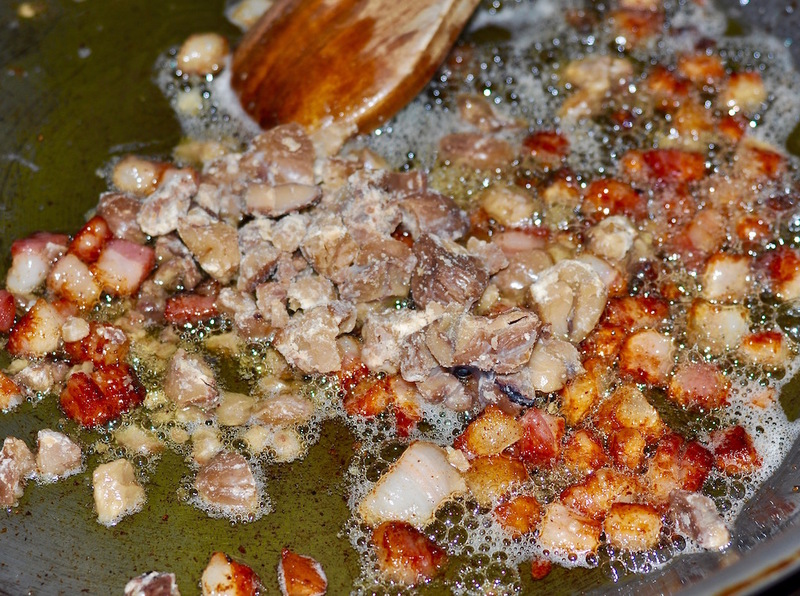 Add the pancetta and sauté until lightly browned, then stir in the chestnuts and sauté another minute. Turn off the heat and let cool for 3 minutes. Mix 3 large eggs and one egg yolk in a bowl with the grated cheese and a generous dose of black pepper. 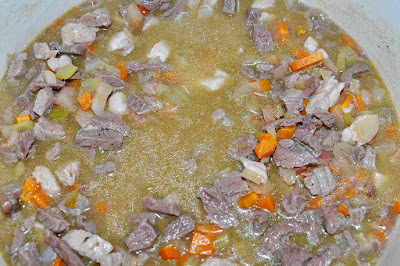 Pour the mixture into the warm pan and stir. When the pasta is al dente add it to the pan and stir vigorously until thoroughly coated. Plate, top with grated cheese and serve.